An outstanding new recording of J.S. Bach’s three Violin Concertos came out in October. It features Japanese-American Baroque violinist Shunske Sato and the adventurous period instrument ensemble, Il Pomo d’Oro, founded in 2012. 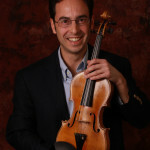 Sato is currently concertmaster of the Netherlands Bach Society Orchestra and Concerto Köln. On the album, he is joined by Bulgarian violinist Zefira Valova for a performance of the Concerto for Two Violins. Also included is a reconstruction of the lost Concerto in G minor, BWV 1056R. The underlying pulse of the second movement feels like an eternal heartbeat. The solo violin enters into a beautiful and intimate aria which takes us on an array of far-flung adventures, while the recurring ostinato of the full ensemble continuously returns “home.” At moments, the music takes unexpected turns and enters a strange world of mystery and lament. Listen to the euphoric, cascade of notes in the harpsichord as we enter the final, climactic cadence. He heard the slightest wrong note even in the largest combinations. As the greatest expert and judge of harmony, he liked best to play the viola, with appropriate loudness and softness. In his youth, and until the approach of old age, he played the violin cleanly and penetratingly, and thus kept the orchestra in better order than he could have done with the harpsichord. He understood to perfection the possibilities of all stringed instruments. – Carl Philipp Emanuel Bach describing his father, J.S. Bach, in a 1774 letter to Johann Nicolaus Forkel who wrote the first biography of Bach.